Desmond Mpilo Tutu was born in Klerksdorp, South Africa on October 7, 1931. His family, like many in South Africa at that time, had very little money. They lived in a small shack with no electricity or sanitation. Although his father was a respected teacher, the family was subjected to the same material deprivation as those around them. As a child, Tutu met Father Trevor Huddleston, a prominent white priest. Huddleston would have a great influence on Tutu’s life and would inspire within him a lifelong devotion to Christianity. At age 24, Tutu began to become more involved politically and wrote to his country’s Prime Minister about “a diabolical policy” of racial discrimination against black people. During this time, he also met and married his beloved wife, Leah. In the aftermath of the horrific Sharpeville Massacre in 1960, Tutu left South Africa for London to study theology at King’s College and commenced work as an assistant curator. While in London, he discovered a new world, one in which there was widespread respect for all people of every color. Tutu then moved to Lesotho, where he became involved in the Anglican Church, and in 1975 he was elected Dean of Johannesburg. Since this was a very public position, Tutu’s speeches were heard all over the world. Additionally, Tutu authored many letters that expressed his continued frustration and desire for reform. One such correspondence was relayed to then Prime Minister, John Vorster. In the letter, Tutu communicated a warning, describing that without justice and freedom for blacks, all South Africans faced a terrible and bloody future. 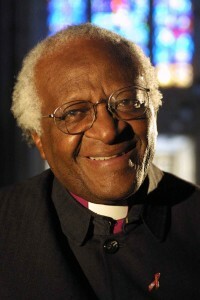 In 1979, as General Secretary of the South African Council of Churches, Tutu initiated a call for sanctions against South Africa, an endeavor that generated great personal risk. He had become a popular international figure, but was viewed by the South African government as dangerous. Several years later, Tutu was awarded the Nobel Peace Prize in 1984, for his support towards individuals and groups in South Africa who, with their concerns for human dignity, fraternity, and democracy, incited admiration throughout the world. While the international community rejoiced, the South African government remained silent. Following this feat, Tutu was elected Archbishop of Cape Town in 1986. Despite drawing considerable support, the government barred all invited guests from attending commemorative ceremonies; nonetheless, Tutu continued to believe that one day all South Africans would be free. His dream was finally accomplished in 1994, when the first democratically comprised Parliament elected Nelson Rolihlahla Mandela as President of the Republic of South Africa. It was Archbishop Desmond Tutu’s privilege to introduce the new President to the crowds of people gathered at the parade in Cape Town.